The culture of Yemen has an ancient history, influenced by Islam. Due to its unique geographic location, Yemen has acquired a very distinctive culture from its neighbors; historically and culturally. 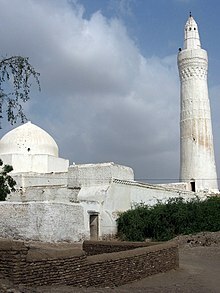 Religion in Yemen primarily consists of two principal religious groups of Islam; Sunni and Shi'a. About 65% of the Muslim population is Sunni, and 30% is Shi'a. Sunnis are primarily Shafi'i, but also include significant groups of Malikis and Hanbalis. Shi'as are primarily Zaidis, though they also have significant minorities of Twelver Shi'as and Musta'ali Western Isma'ili Shi'as (see: Shi'a Islam in Yemen). The Sunnis are predominantly in the south and southeast. The Zaidis are predominantly in the north and northwest, while the Jafaris and Isma'ilis are mostly located in the main centers of Sana'a and Ma'rib. There are mixed communities in the larger cities. Yemen's national anthem is "United Republic" written by Abdallah "al-Fadhool" Abdul Wahab Noman. UNESCO proclaimed the tradition of poetic songs in Sana'a, called al-Ghina al-San'ani, a Masterpiece of the Oral and Intangible Heritage of Humanity on November 7, 2003. The traditional work of Yemenite Jewish silversmiths is widely admired and collected by museums. Traditional Yemenite architecture is widely admired. The history of Yemeni theatre dates back at least a century, to the early 1900s. Both amateur and professional (government-sponsored) theatre troupes perform in the country's major urban centers. Many of Yemen's significant poets and authors, such as Ali Ahmed Ba Kathir, Muhammad al-Sharafi, and Wajdi al-Ahdal, have written dramatic works; poems, novels, and short stories by Yemeni authors, such as Mohammad Abdul-Wali and Abdulaziz Al-Maqaleh, have also been adapted for the stage. There have been Yemeni productions of plays by Arab authors, such as Tawfiq al-Hakim and Saadallah Wannous, as well as by Western authors, including Shakespeare, Pirandello, Brecht, and Tennessee Williams. Historically speaking, the southern port city of Aden is the cradle of Yemeni theatre; in recent decades, the capital city of Sana'a, has hosted numerous theatre festivals, often in conjunction with World Theatre Day. Yemeni cuisine is entirely distinct from the more widely known Middle Eastern cuisines, and even differs slightly from region to region. Throughout history, Yemeni cuisine has had a little bit of Ottoman influence in some parts of the north, and very little Mughlai-style Indian influence in Aden and the surrounding areas in the south, but these influences have only come within the last 300 years. Cheese, butter, and other dairy products are less common in the Yemeni diet. Buttermilk, however, is enjoyed almost daily in some villages where it is most available. The most commonly used fats are vegetable oil and ghee used in savory dishes, while semn (clarified butter) is the choice of fat used in pastries. Although each region has their own variation, Saltah is considered the national dish. The base is a brown meat stew called maraq, a dollop of fenugreek froth, and sahawiq or sahowqa (a mixture of chili peppers, tomatoes, garlic, and herbs ground into a salsa). Rice, potatoes, scrambled eggs, and vegetables are common additions to saltah. It is eaten traditionally with Yemeni flat bread, which serves as a utensil to scoop up the food. Shakshouka is a popular dish in Yemen. Shakshouka is made with eggs, meat, tomatoes, peppers, onions, and spices (often including cumin, turmeric, and chili peppers). It is usually served with Yemeni flat bread or white bread as a utensil. Other popular dishes include: aseed, fahsa, thareed, samak mofa, mandi, kabsa, fattah, shafut, and fatoot. Malooga and laxoox are the most popular kinds of flat breads found in Yemen. Malooga is eaten with bean dishes, such as ful medames (similar to rice and beans). Laxoox is eaten with curries, stews, and soups, as well as rice dishes. Bint Al-Sahn is a popular dessert dish, which is eaten with honey. Qat, also known as Khat (Catha edulis), is a widely cultivated plant in Yemen and is generally used for chewing. When khat juice is swallowed it produces an amphetamine-like effect. Yemenis wear traditional costumes and chew the narcotic khat-plant in the afternoons. Chewing khat is also part of the Yemeni business culture to promote decision-making, but it does not expect foreigners to participate. Football is the most popular sport in Yemen. The Yemeni national football team competes in the FIFA and AFC leagues. The country also hosts many football clubs. They compete in the national and international leagues. Yemen's mountains provide many opportunities for outdoor sports, such as biking, rock climbing, trekking, hiking, skiing, mountain jumping, and other more challenging sports, including mountain climbing. Mountain climbing and hiking tours to the Sarawat Mountains and the Jabal an Nabi Shu'ayb, including the 5,000 m peaks in the region, are seasonally organized by local and international alpine agencies. ^ "The World Factbook — Central Intelligence Agency". www.cia.gov. Retrieved 14 April 2018.